Join Our Holiday Hunt — Where Sharing Joy Is a Snap (or 5)! While white-sand beaches and comfortable temperatures may not fit everyone’s mental vision of the holidays, both are plentiful on the Grand Strand — and they’re both waiting for anyone seeking an escape from the ice and snow back home. The Myrtle Beach area offers an easy-to-reach way to escape the winter weather without having to forgo the holiday cheer. Visitors can leave the snow shovel and heavy winter coat behind — just pack a couple light sweaters (and maybe even shorts and sandals), and make Bay View on the Boardwalk and the Myrtle Beach oceanfront your home for the holidays. Located right on the famous Myrtle Beach Boardwalk, Bay View on the Boardwalk can make your family’s holiday vacation memorable with a wealth of amenities and a wide range of accommodations. And during your visit, you can use your smartphone to join in our special Holiday Hunt contest. 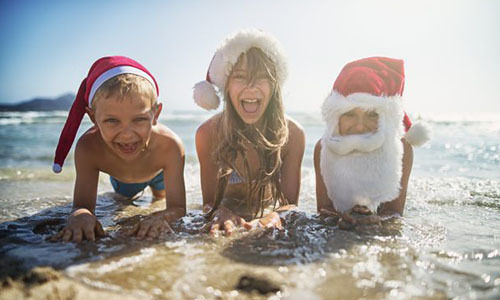 Explore all of the fun seasonal festivities on the Grand Strand, capture some special moments with your phone’s camera, and share them with us on Instagram. In all your photos, be sure and tag ‪@BayViewMB and use the hashtag #BayViewHolidayHunt to spread the holiday spirit. Pic 1 – Holiday Message: To get your Holiday Hunt rolling, write a giant holiday message on the beach — maybe something like “Season’s Greetings from the Fullers!” Let your imagination run wild, and make sure that your message is big enough for Santa to see from high above as he flies over Myrtle Beach in his sleigh. Once your merry masterpiece is complete, post a photo of it on the ’Gram. Pic 2 – Photo With Santa: The next mission on your Holiday Hunt to-do list is a photo with Santa Claus. Before setting out on his Christmas Eve journey around the globe, he’ll be soaking in the relaxed atmosphere of the Myrtle Beach area. During your stay at Bay View on the Boardwalk, you’ll have a few photo ops within easy reach. The jolly old elf himself will be making several appearances at Santa’s Village at the North Myrtle Beach Park & Sports Complex through the end of December. Pic 3 – Holiday Lights: As Christmastime approaches, the Grand Strand is transformed into a (temperate) winter wonderland with loads of festive decorations. Check out one of the Myrtle Beach area’s winter festivals or holiday displays, and take a photo with your favorite holiday lights. An excellent option for knocking this one out can be found at Brookgreen Gardens’ Nights of a Thousand Candles, where more than 5,000 hand-lit candles and countless strands of twinkling lights illuminate the gardens’ grounds. A favorite area tradition, the event runs through December 17th. You could also take a drive through North Myrtle Beach’s Great Christmas Light Show. This holiday cheer-boosting experience features over 500 magical light displays (some up to 55 feet tall) and a section of lights synchronized with holiday music. You can take it all in through December 31st. Pic 4 – Holiday Ornament: While you’re gazing at all the Christmas lights, you likely won’t have to look too hard to locate a magnificent Christmas tree nearby. Find an ornament on the tree that’s especially eye-catching, and take a photo of it. Be careful not to knock it off its perch — just get close enough to snap the perfect Holiday Hunt photo. Pic 5 – Family Greeting Card: The last item on the Holiday Hunt checklist is the most special. We encourage you to take and post a holiday greeting card-worthy family photo. The background choices are numerous — you could gather in front of the nearby Myrtle Beach SkyWheel, pose on the beach just before sunset, or find a backdrop that’s special to your family. Whatever you choose, years from now, you’ll look at the photo and remember all the great times you had on your Grand Strand holiday vacation. We hope you enjoy your Myrtle Beach retreat and the adventure of completing our Holiday Hunt as much as we enjoy having you as our guest at Bay View on the Boardwalk. Make sure you post all your photos to Instagram and tag them ‪@BayViewMB – and don’t forget to include #BayViewHolidayHunt in the caption. Thanks for playing along and for spending your holidays with us at Bay View on the Boardwalk!